Applause! 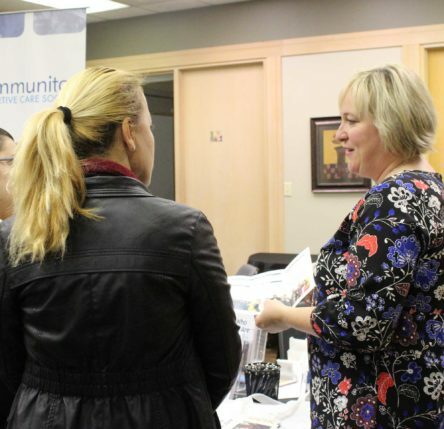 Thank you to all who attended our event! 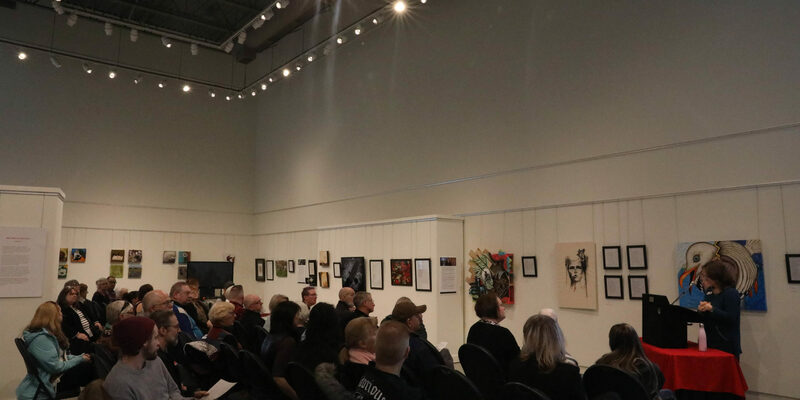 An open and supportive crowd of art enthusiasts attended a Poetry Reading and Artist Talk at the O’Connor Group Gallery in Chilliwack on Saturday. 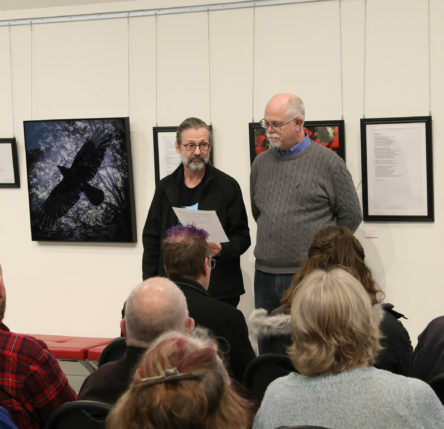 The event was hosted by Communitas Supportive Care Society and the Chilliwack Visual Artists Association (CVAA) and was part of Hear and See: Poetry and Art for Mental Health, an exhibit that combines the works of 14 poets and 14 artists, each one with lived experience of mental health challenges. 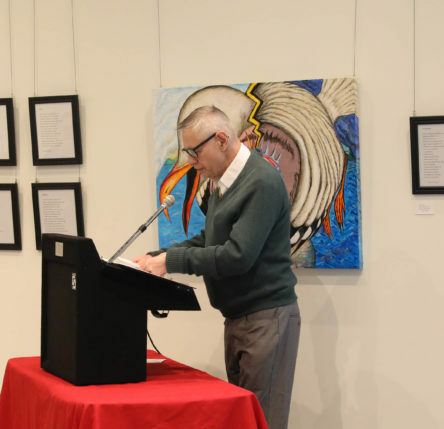 At the Poetry Reading and Artist Talk, each poem was read aloud and the corresponding artist shared about how they interpreted the poem that they were given. 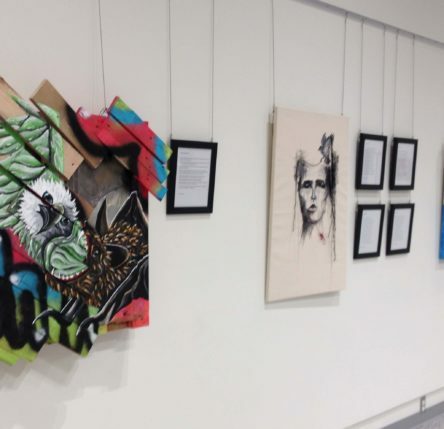 The poetry and art pieces are as diverse as the experiences of those who created the pieces: some contributors live with mental health challenges like eating disorders, schizoaffective disorder, or anxiety while others as friends and family members engage with the experience as they support the people they love. 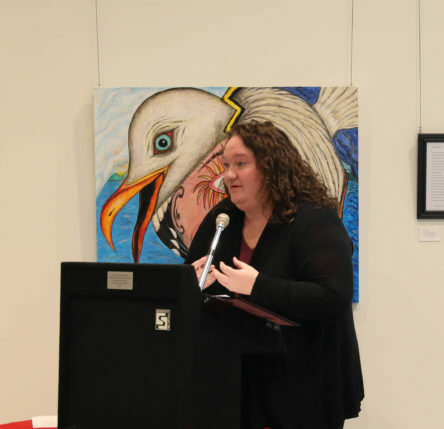 Karyn Santiago, CEO for Communitas, had the opportunity to read her daughter’s artist’s statement and made the closing comments at the reading. 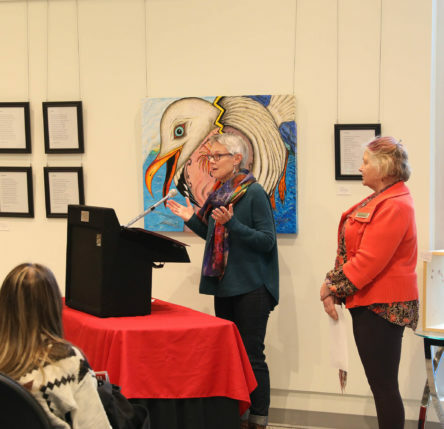 She talked about the impact that this travelling exhibit has had on those who have seen it and expressed gratitude to all those who contributed. 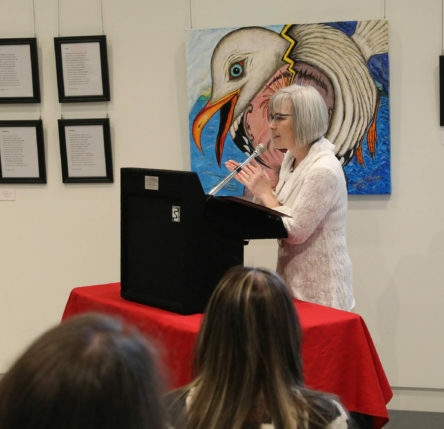 “We are so grateful to the poets and artists who gave of themselves to put on this exhibit and help us continue the conversation around mental health,” she said, adding that the support of the CVAA made the exhibit even more meaningful. 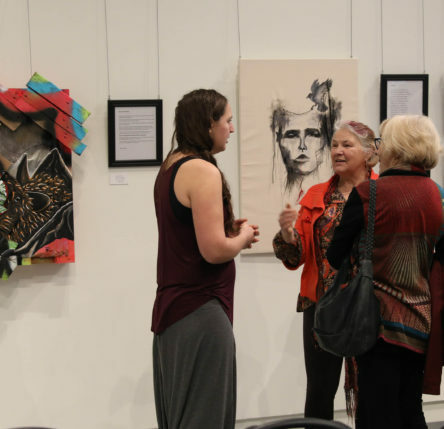 Members of the CVAA held a simultaneous exhibit and fundraiser called “1’x1’”. Artists were given a one-foot square canvas on which to create an art piece. These pieces were then sold with the proceeds to support Communitas and Chilliwack Community Services. 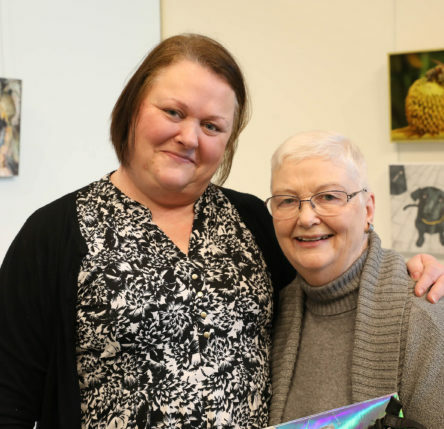 Mary-Lee Merz, a CVAA member and contributor to the fundraiser, said that the collaboration and the quality of the exhibit exceeded their expectations. 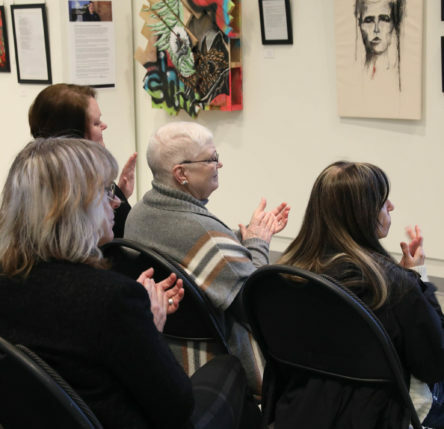 “This exhibit and this event has brought a depth to our gallery that we would love to see continue,” she said. 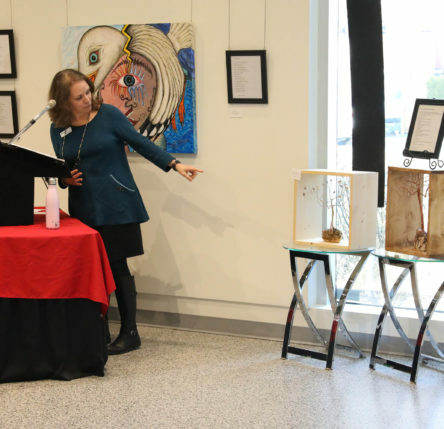 Hear and See: Poetry and Art for Mental Health continues until this Saturday, January 19th. All photos by Krista Petrie. 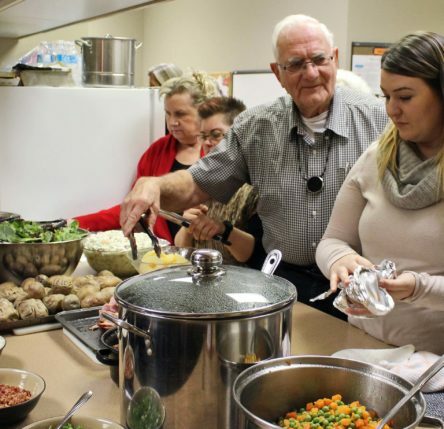 Visit our Facebook page to see more images from this event!